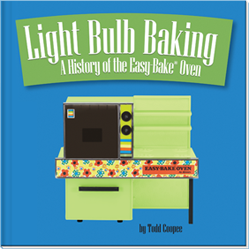 Light Bulb Baking: A History of the Easy-Bake Oven is the first definitive retrospective of the Easy-Bake Oven. The award-winning book celebrates the toy’s journey from children’s toy to pop culture icon and inductee to The National Toy Hall of Fame. The flip book below provides a series of sample pages from each chapter in the book.